COMMENTARY ON "PROPHECY AND SCRIPTURE"
This week’s lesson is titled “Prophecy and Scripture” and focuses on the fulfilment of Old Testament prophecies. The day’s study examines a key passage in 2 Peter 1:16–19 where the apostle is encouraging believers to pay attention to the more sure prophetic word which shines in the dark like a lamp. The lesson correctly identifies Peter’s main point here: the Word of God is more sure than even his own eyewitness testimony concerning his having seen the Lord Jesus Christ transfigured upon the mountain. Ironically, the writer concludes with the following words: “So if Jesus and Peter took the Bible seriously, how dare we do otherwise?” Indeed. By any reasonable observation, the Seventh-day Adventist church does not take the Bible as seriously as it ought to. It has supplanted the prophetic and apostolic testimony of the Old and New Testaments with additional revelations that cannot help but compete with the authority of the Word of God (despite the church’s denials). The fruit of extra-biblical revelations can be witnessed in the attitude of Adventist to the authority Word of God itself. The famous Adventist scholar Samuel Bacchiocchi, for example, writes in his Biblical Perspectives publication (no. 102) that the Seventh-day Adventist church has historically rejected the doctrine of biblical inerrancy as a heresy because it makes the Bible “too-divine.” One is left wondering what could be so heretical about having a truly divine Word that reflects the character of its Author. This lesson focuses on 1 Peter 1:10–12, where the writer correctly notes that primarily two things were predicted by the Old Testament prophets, the sufferings of Christ and the subsequent glories that would follow. The author explains that today’s believers are in a privileged position in salvation history, since much more has been revealed to them than to the prophets of old. A division, however, is inserted between the believer’s knowledge of Christ’s sufferings, and that of the glories to follow. The writer claims that Peter’s readers “will have to wait, as we, for ‘the glories that would follow.’ “ The implicit claim is that these glories can only be referring to some eschatological events. Unfortunately, Seventh-day Adventist teachings fail to adequately convey Christ’s resurrection and exaltation to the right hand of God the Father. If Christ only entered the most holy place in heaven in 1844 (there to complete an incomplete atonement), the glory that Peter’s readers were told about could only refer to a future reality. This lesson dwells upon Peter’s mention of his having been an eyewitness to the transfiguration of Jesus Christ. 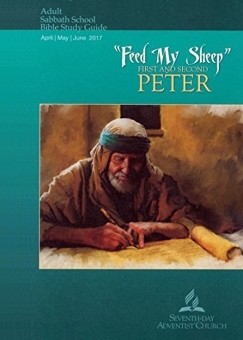 The author notes that this particular event sood out for Peter, among many others in the life of Christ. The lesson goes on to highlight three specific reasons: (1) “It reveals Jesus to be the Son of God,” (2) “that His time on earth was spent according to God’s plan,” and (3) “that He had a very special relationship with the Father.” Each of these three statements, when understood in light of historic Adventism, say very different things about Jesus than might otherwise seem. It has been acknowledged today even by the church that the early Adventist pioneers held to Arian views about the person of Jesus Christ. Arianism is an ancient heresy that denies the full deity of Christ. Adventists often counter, however, that Ellen G. White eventually “cured” the church of its anti-Trinitarianism and steered it toward orthodoxy. Such a claim either reveals an ignorance about the nature of the Trinity or is simply misleading, since White’s views have been acknowledged to differ from classic Trinitarianism even by Adventist scholars. In reality, Ellen White held to a modified Arianism, which is what a heresy called Tritheism essentially is. For her, the Godhead was a placeholder or position for “the three heavenly worthies” to occupy. Even today, the official statement of beliefs of Seventh-Day Adventists uses the following wording: “There is one God…a unity of three coeternal Persons.” From a Biblical perspective, God is not a “unity,” but rather a single being. The persons of the Trinity are not simply united in purpose, they are one in essence. So when the author writes concerning the Transfiguration––(1) “It reveals Jesus to be the Son of God,” (2) “that His time on earth was spent according to God’s plan,” and (3) “that He had a very special relationship with the Father”––the reader must understand these statements in light of the Seventh-Day Adventist worldview. What does it mean for Christ to be the eternal Son of God? What kind of special relationship does the Father have with Christ? Has the Father exalted Christ from the status of an angel (as some of Ellen White’s writings claim)? Is the Father merely united with Christ in purpose, not in essence? This lesson focuses on 2 Peter 1:19 paying attention to Peter’s mention of a morning star rising in the hearts of believers. The author describes “believers as fallen beings, living in a fallen and dark world.” They need the Word of God to lead them to the light, which is Christ. The biblical reality is that, while the truly born-again believer in Jesus Christ may still have a fallen body (the Bible calls this “the flesh”), he is no longer walking in the darkness (1 John 1:5–7), and we must make a distinction between believers being found in a dark world, and believers themselves being part of that darkness. Unfortunately, Adventism fails to understand the New Birth and the reality of regeneration, where a person who repents and puts their trust in Jesus Christ is made alive and is now a new creature. Because of this, the lesson seems to downplay the darkness of sin, while simultaneously failing to convey a biblical idea of light (as understood through salvation). This lesson examines what Peter meant about prophecies in 2 Pet 1:19–21. Unfortunately, the author completely misinterprets Peter’s statement: “No prophecy of Scripture is of any private interpretation” (NKJV). The author claims that it is the believing community’s responsibility to work together in order to properly understand prophecy. In doing so, the writer relies upon a far too restricted sense of the word “prophecy” and the NKJV’s less-than-satisfactory translation of the word “is” in 2 Pet 1:20. In other words, these are men of God (not just prophets, in the modern sense), who spoke words that really came from God, not themselves, because they were carried along by the Holy Spirit. This passage is a wonderful piece of evidence for the verbal inspiration of the entire Word of God, because words that come from God must reflect the character of God, being fully true and without error.